Ok so this week has been very trying, my patience has been pushed to the limits with an extremely active toddler who gets into everything and spends half his day tormenting my chihuahua Harvey which causes Harvey to bark incessantly and drives me insane!! And then there is the whole business of climbing out of our crib now, yesterday he did not even take a nap because he spent the entire nap time climbing out, he then climbed out of his crib until 12:30 in the morning last night, waylaying my cookie making and putting me at piping the last dot at 4 a.m.
Royal icing can be a pain to work with and can take some time to master, so the first couple of times you work with it, it wont be perfect. Unfortunately this is only my 3rd time working with royal icing and that mixed with my blurry lack of sleep eyes did not help my situation. Thus I produced cookies that are less than what I hoped for. These are cookies I made for my aunt who is blind, she asked me to make a dessert for her and her friends for a Valentines get together that wasn’t too messy as her friends are also blind. So I figured I would make heart shaped chocolate sugar cookies, that are delicious but is an extremely fussy dough (which did not help my already downhill night lol). I was just going to simply ice them when I had the stroke of genius to pipe braille on the cookies! After baking and cooling the cookies I piped the outline, flooded the cookies, waited and then piped the braille. Now these cookies do not look the best but the braille really sticks out and you can feel each dot with your finger. 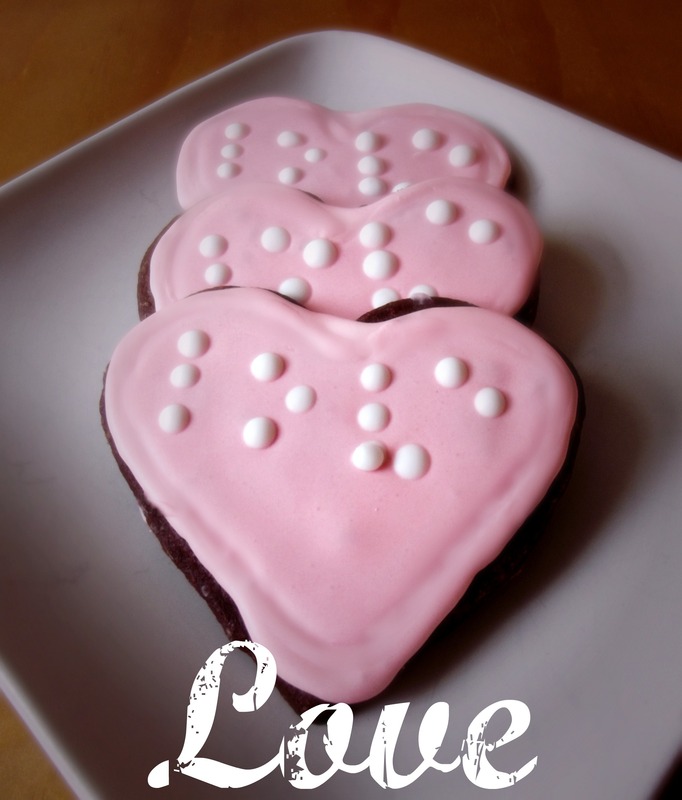 The cookies say “Love” and even though they look a wreck the braille came out really good. My icing was a little thin so my braille dots spread a little and I had to go back over them again this morning. I learned alot this time around about royal icing and I feel next time I will do an even better job! Preheat the oven to 325˚ F. Line a baking sheet with parchment paper or a silicone baking mat. On a lightly floured ( I used more confectioners sugar instead of flour) work surface, roll the dough out to about ¼-inch thickness. Cut out desired shapes with cookie cutters and place cut outs on the prepared baking sheet. Bake 10-12 minutes, just until set. Let cool on the baking sheet about 5 minutes, then transfer to a wire rack to cool completely. Decorate as desired. *Note – The yield of this recipe will depend on the size and shape of cookie cutter you use, so an accurate estimate is not possible. I used maraschino cherry juice to tint my royal icing pink and add a little flavor.